Long Story Short. 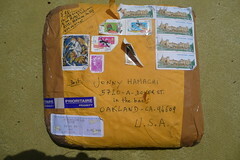 I received a beautiful package from France, Europe. 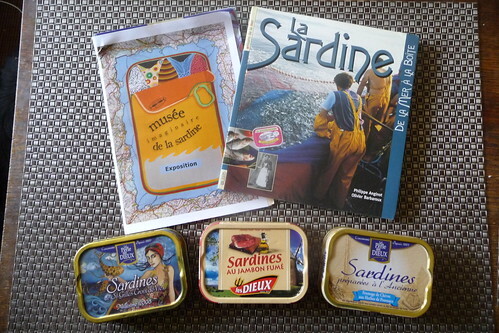 It involved a book, three tins, and other informative papers. So tonight we dine ala Philippe. 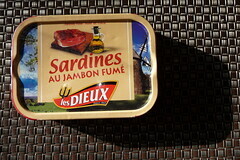 Sardine Les Dieux au Jambon Fumé. Mixed baby greens from the garden. A bit of baguette, half toasted, half not. 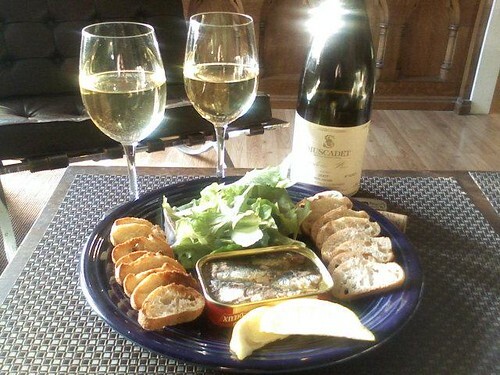 07 Chateau de la Fessardiére Muscadet. A Quality Oil, No Brinyness, Good Texture, Firm with a tiny Vertebrae Crunch. A Smokey Sublte Ham Ness, with little bits in there. I love the little bits. These are really good and, Well, now they're gone. Worked wonderfully with the baby greens and bread. Very Very. I tried to find a wine from a bit closer to Vendée. Even went to Kermit Lynch, possibly the most esoteric of French wine importers here in the States. Lots of obscure regions and wines. Some might say the Loire is an obscure region but I've been selling and enjoying their wines for years and years. Booth McKinney. This is a wonderful wine from the North Coastal region. A bit bigger than I imagined, but a perfect pairing for our Tin Course. Dry, Crisp, and Yummy. All In All a Wonderful Experience. Five out of Five Tins. There is So much more to tell. Soon I shall tell long and photographic stories of the other two tins, the papers, and the book. 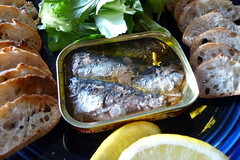 Muscadet is a good idea and I'm glad you appreciated smoked ham with sardines as it's anyhow a kind of revolution in the sardine world ! Way to step it up a notch or three. To further enhance your experience, here is a link to a French naval architect who drew the lines for a replica of a Sardin boat, probably from the 19thC., though he doesn't say.